The first 130 laps of Friday night’s NASCAR Whelen Southern Modified Tour race at Caraway Speedway was rather uneventful, to put it lightly. 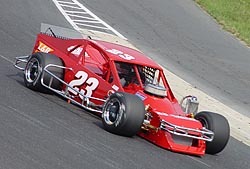 There were just three cautions, all for single-car spins, and the field of 17 ground-pounding Modifieds strung out in single-file order, just riding around, waiting for that last 25 laps to race and waiting to see if the threatening skies might actually open up. The rain never came. The excitement did. The night’s Bud Pole winner, Jay Hedgecock (who had also won the last two poles at Caraway), started the night in fifth after the redraw and worked his way to the front on lap 40. Hedgecock could put his #41 wherever he wanted on the track, high or low, and it stuck. Hedgecock put a hurting on the field, lapping all but the top-eight cars, including normal front runners Burt Myers, Bobby Hutchins and series’ point leader Junior Miller. But Brian Crammer was coming. The Southern Tour regular from the North (Crammer is from Howell, NJ) came from his 11th starting spot and moved into second just before halfway. The rest of the race, he spent chasing down Hedgecock. Then where was Brian Loftin. Loftin, who started seventh, just rode around most of the night, keeping his car under him and keeping out of trouble, but also within sight of the leaders. He wasn’t super fast, but he wasn’t falling back either. It worked that way for the first 130 laps. Then, all hell broke loose. Crammer finally caught up to Hedgecock around lap 130 and really started putting the pressure on the former Caraway regular around lap 140. With just five laps to go, Crammer made his move on Hedgecock coming off of turn two. Hedgecock got a little bit loose just as Crammer jumped to the inside and they bumped wheels. The end result was Crammer spinning out, but keeping the car off the wall, while Hedgecock kept on. and putting him to the back of the field and out of contention for the win. The action wasn’t over yet though. That caution resulted in a green-white-checker finish with Loftin now behind Hedgecock. But the white and checkers never came. First, a couple of cars running in the back got together and crashed on the front stretch, resulting in another caution. At this point, the race was now over its scheduled 150-lap distance and the cars continued to pace around the track while officials worked to clean up the mess. On lap 159, officials decided to red flag the race to help and get the track cleaned quicker. 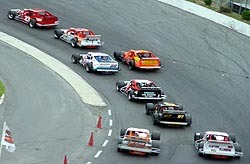 The field came to a stop on the backstretch, coming into turn three. Hedgecock’s car came to a stop in turn one. He was out of gas. Loftin (#23) and Crammer (#89) came through the field to get to the front. But because of the red flag, Hedgecock’s team could do nothing to the car once a wrecker pushed him to the pits. Once the yellow came back out, they got gas in the car, but the damage was done and Loftin had inherited the lead for yet another green-white-checkered finish. 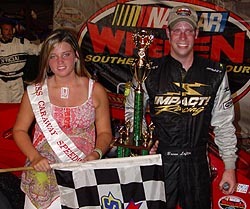 This time, the Mods got the final two laps in and Loftin held off Tim Brown to secure his first NASCAR Southern Modified Tour win of 2005. “It was weird,” said Loftin of the circumstances of his win. “I wanted to beat (Hedgecock) fair and square and I think I might have been able to beat him. We were just back there riding all night. I knew that I wasn’t going to run him down (early) because the track was so slick. 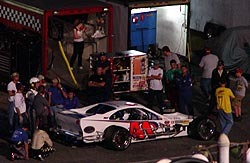 Jay Hedgecock's #41 sits in the pits, waiting to get worked on during the red flag. “I hate it for him. He had a good car for sure. The 89 (Crammer) had a good car for sure as well. I hate it for him as well. I wanted to beat those guys straight up, but the way our year has been, I’ll take it anyway I can get it." The way Loftin’s year has been has been a tough one. In the first two races of the year, he completed a total of 45 laps, retiring from both races with ignition problems. He found himself outside the top-10 in points. So the win was sweet for Loftin, any way he could get it. “The first two races, we barely even made a couple of laps,” added Loftin. “The third race we came back and played it too safe, had the car a little too tight and just had to ride along. “We weren’t close to running out of gas. We run our car completely full of gas, so we could have went 200 laps if we needed too. the finish. Speed51.com was not able to catch up with Hedgecock, but will have more with him later this week in Leftovers. Crammer was not happy about his run in with Hedgecock. “Everytime I come down here, I do everything I can to run clean with everyone,” said Crammer. “I ran behind him for five laps and I wasn’t touching him. I got to his door and he was pushing like a Peterbuilt. Then he stands on the gas, runs it like its Eldora and hits my right front and spins me. “That is twice now he’s cost me a race here. I try to run everyone clean. It is ridiculous. After all of the late race excitement, Tim Brown found himself second, with Alex Hoag picking up a career-best finish of third.